Deciding on a paint colour for your home or office space can be a difficult decision. If you want to accurately test paint colours before you buy, try these tips! Don’t head out to the paint store in search of a single perfect colour. Instead, browse the selection and choose your favourite colour chip or swatch. Then, pick out one shade darker and one shade lighter than your chosen colour. The light in your own space will alter the appearance of the paint, so you may end up preferring a lighter or darker shade than you first thought. We recommend testing out at least three to five different shades in total. Never purchase a paint colour based on chips or swatches alone. You’ll get the best sense of how the colour will look if you paint a sample area at home, as even the most subtle change in shade can make or break your wall colour. Take home a few similar sample tins with you and try each one out by covering a large sample space. If painting directly onto the wall isn’t an option, we suggest painting a large piece of fibreboard or drywall. This will enable you to move the colour around the room, to other spaces, and different lighting. The colours you’re testing will read differently depending on the amount of light that hits them, which means trying them out on more than one wall is a smart idea. Test each colour on its own, away from other colours that you’re trying out or existing wall colours. Testing two or more shades next to each other will bring out undertones that won’t be there if the colour is on its own, giving you an unrealistic idea of the finished product. 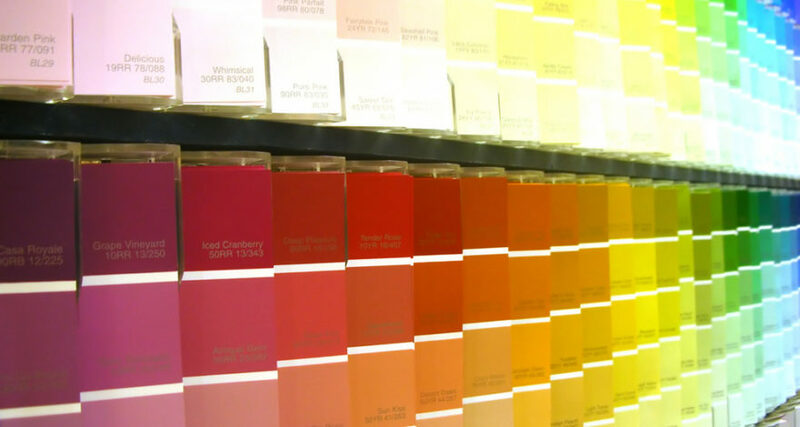 Paint a sample on each wall to see how the colour plays with both natural and artificial light in your chosen space. Notice how the paint changes from day to night, too, and consider what time of day you’ll most often be in the room. You want to like how the colour looks at that time. Always test a sample by painting two coats of colour. The second coat usually makes a big difference in the way a paint colour reads and it’s the amount of coverage you’ll typically need on any wall. Once you have your samples on the walls, move furniture against it and hang your favourite art to check that your choice works in the space. Take note of how each hue either complements or contrasts the furnishings you own or are planning to add. Painting near hardwood floors or close to a focal piece of furniture such as a leather couch will help you to visualise the finished room. If you’d like some expert advice on colour choice, call APMG Painting Melbourne and take advantage of our colour consulting services. We can provide a free sample colour demonstration to help you make an informed decision.